Before you roll your eyes and decide to say ‘let’s not get ahead of ourselves’ after the Black Queens beat Cote d’Ivoire by a lone goal to lift the maiden edition of the Wafu Zone B Women’s football tournament; before you point out that the Black Queens have never won the Women’s African Cup, and never made it to the Olympics, calm down, take a deep breath. I beseech you to carry on reading this article. Ghana is blessed with an array of female talent. The Women’s Premier League has 16 teams, with a lot of zonal teams scattered across the length and breadth of the country. I dare say this is a great employment booster; we are looking at a sector of football that provides about 500-1000 jobs. It may seem small, but they do say little drops of water make a mighty ocean. There is so much unemployment in this country that pockets of employment opportunities should always be harnessed. Despite all the drama and little remuneration, Ghana’s Women’s League is one of the best on the continent. The league has been the supplier for the various women’s national teams. Speaking of national teams let me start with Ghana’s U-17 side. The Black Maidens have appeared at all Fifa U-17 Women’s World Cup tournaments. In 2012, Ghana clinched bronze in Azerbaijan, becoming the only African country to have won a medal at that level. It’s a no-brainer that Ghana is blessed with so much talent; sadly this gold mine hasn’t been properly utilized. In 2016, the same Maidens reached the quarterfinal of the same competition. Not an improvement of the 2012 feat. However, their story is a sad one. The lasses had little time to prepare for the tournament and their per diems were not paid. The Maidens lacked the basics at the World Cup and there were instances when they were even teased by compatriots from other competing nations because of their shabby apparels. Despite the trauma and the calls for help during the tournament, the ladies managed a last eight spot. Imagine what they would have done with a little push. We are left with ‘what ifs’. With a little support, the Maidens can be the greatest export for Ghana in women’s football, hence the need to invest in them. And if we get the basics right, the future would always look bright. The U-20s, or the Black Princesses, are not exempted from the drama. The 2016 team is still owed bonuses from tournaments they took part in, but this has been swept under the carpet. Since 2010, the Princesses are yet to miss a World Cup. The same troubles of the Maidens bedevil the Princesses. What makes this worse is that, sometimes, the great talents of the U-17 level give up or refuse to ever don the national jersey again after previous experiences have scarred them. Some continue to play, but are more cautious and have a resentment for the system. The neglect, poor preps and the lack of planning, has been the major reason for the nation not making it past the group stages of the U-20 Women's World Cup. It is no surprise that teams Ghana had defeated at the U-17 side would go on to wallop the same team in future U-20 meetings. The only difference these nations have is, they put in work and make a clear progression from the U-17 to U-20. Prior to our dancing to the Black Stars performances at the 2006 World Cup, our senior women’s team, the Black Queens, had already been to the tournament - not once, but twice. In recent times, it’s been a struggle for the ladies to make the cut for the global showpiece. There have been demonstrations, prolonged issues about bonuses and little support by the populace when it comes to their qualifiers. My mind goes back to 2016 All African Games. The ladies, after missing out on a spot in the Olympic qualifiers for Africa, went all out to win gold in the AAG. Yet, the Queens had to tussle, picket at the M-Plaza Hotel in Accra and battle to get their bonuses. In 2018, the nation can reset its treatment to women’s football and realize there is so much potential to do better. It would be foolhardy to advocate for equal pay because the two fingers are definitely not the same. I urge for more support, and the nation (government, GFA, corporate bodies and the entire country) must realize the untapped treasures we have. The coming of the 2018 Women’s African Cup, to be hosted here in Ghana, should set the stage for us to organize a tournament that will have Africa applauding. It also affords us a chance to make preparations that will see the Queens topple perennial rivals, Nigeria's Falcons, to win the trophy, and then qualify for a World Cup. I leave with my paraphrased version of Deuteronomy 30:19. "This day I call the heavens and the earth as witnesses against you [Ghana] that I have set before you the life of women’s football and the death of women’s football, the benefits or the collapse. Now, choose life." Before you roll your eyes,decide to say let’s not get ahead of ourselves after the Black Queens beat Cote D’Ivoire by a lone goal to lift the maiden edition of the Wafu Zone B Women’s Football Tournament, before you point out that the Black Queens have never won the Women’s Afcon and never made it to the Olympics, calm down, take a deep breathe and I beseech you to carry on with this article. Ghana is blessed with an array of talent.Ghana’s Premier women’s league has 16 teams with a lot of zonal teams scattered across the length and breadth of the country.I dare say a great employment boost, roughly we are looking at a sector of football that has over 500-1000 jobs.It may seem inadequate and small but little drops of water make a mighty ocean.There is so much unemployment in this country and pockets of employment opportunities should always be harnessed.In all the drama and little remuneration, Ghana’s women’s league is one of the best on the continent.The league has been the supplier for the various women’s national teams.Speaking of national teams let me start with Ghana’s U-17 Women’s national football team. The Black Maidens have made appearances at all Fifa U-17 Women’s World Cup.In 2012, Ghana clinched bronze at Azerbaijan being the only African country to win a medal at the U-17 Women’s World Cup level.Its no brainer that Ghana is blessed with so much talent, sadly this gold mine we have in talent hasn’t been properly utilized, In 2016, The Black Maidens reached the quarterfinal.Not an improvement of the 2012 feet.However, their story is a sad one, the lasses had little time to prepare for the tournaments and their per diems not given.The Maidens lacked the basics at the World Cup and there were instances they were even teased by other countries on their apparels.In all this trauma and the dire calls for help during the tournament, the ladies managed a last 8 stop.Just imagine if the push was there, we are left with ‘what ifs’ which shouldn’t be so.Imagine with a little push and support the Maidens can be the greatest export for Ghana in Women’s football hence there is a need to invest in them if we get the basics right the future would always look bright. 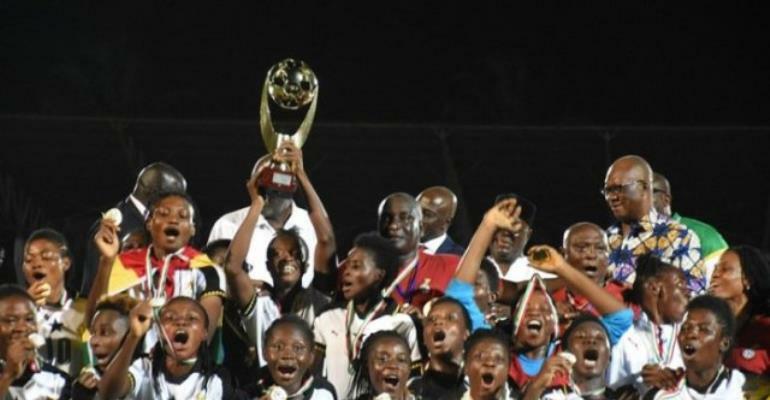 I now proceed to the U-20, The Black Princesses, if you are reading this, the 2016 team is owed bonuses, this has been swept under the carpet.Ever since 2010, the Princesses are yet to miss a World Cup.The same troubles of the Black Maidens bedevil the Princesses.What makes this worse is that sometimes the great talents of the U-17 level give up or refuse to ever dawn the national jersey again after past experiences.Some continue but are more cautious and have a resentment for the system.The neglect, poor preparations and the lacking of planning have been the dent in the nation not making it past the group stages.It is no surprise that teams Ghana will beat at the U-17 side would come on to wallop Ghana at future U-20 level. The only difference these nations have is putting in work and a clear-cut progression from 17 to 20 hence they would come off better. Prior to we dancing to the Black Stars performances at the World Cup our Senior women’s team, the Black Queens had been there not once but thrice.In recent times it’s been a struggle for the ladies to make the cut for the World Cup.There have been demonstrations, prolonged issues about bonuses and little support by the populace when it comes to their qualifiers.My mind cast back to 2016 all African games, the ladies after missing an Olympic spot in the Olympic qualifiers for Africa went all out to achieve gold in the All Africa games.Yet the Queens had to tussle to get their bonuses. In 2018 the nation can reset its treatment to Women’s football and realize there is so much potential to do better.It would be foolhardy on my part to advocate for equal pay because the two fingers are definitely not the same. I'm urging for more support and the nation (government, GFA, corporate bodies and the entire country)realizing that we have gold and we are failing to tap it.The advent of the 2018 Women’s Afcon sets the pace to organize a tournament that will have Africa applauding and preparations that will see the Queens topple Nigeria to win the cup and qualify for a World Cup. This day I call the heavens and the earth as witnesses against you(Ghana)that I have set before you the life of women’s football and the death of Women’s football, the benefits or the collapse.Now choose a life of Women’s football in Ghana.